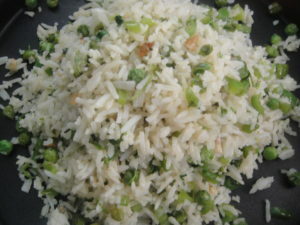 Garlic Fried Rice is a simple recipe of cooked rice. 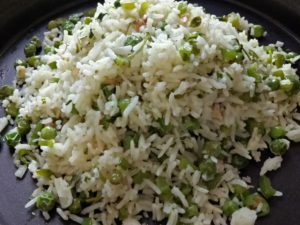 You can prepare this dish with freshly cooked or leftover rice. 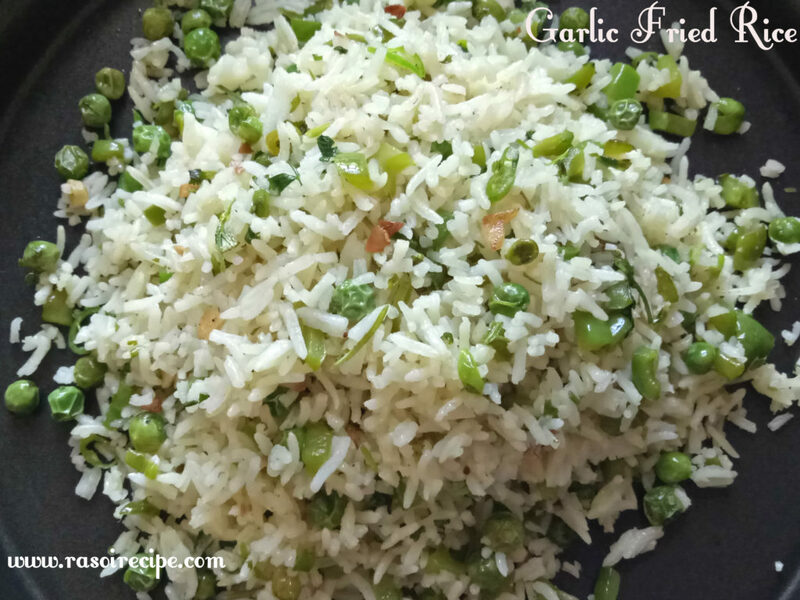 Garlic flavour is predominant in this dish, if you love garlic flavour in your dishes this recipe is for you. All you need is few veggies of your choice, I am using all green vegetables. 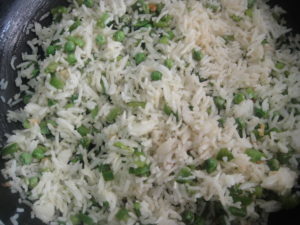 For this recipe, you need cooked rice, capsicum, green peas, garlic, coriander,salt and chilli sauce. Pack this fried rice in lunch box of your kid or serve it as a breakfast recipe. 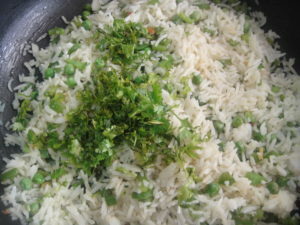 For more rice recipes check Neer Dosa (Rice Crêpe – South India Cuisine) , Phirni (Rose flavoured Indian rice pudding) , Hyderabadi Chicken Biryani (My mother’s recipe) , Chana Dal Pulao (kabuli), Aloo Matar Pulao (Green Peas Potato Pulao) , Chicken Pulao / Chicken Pilaf (How to make chicken pulao) . 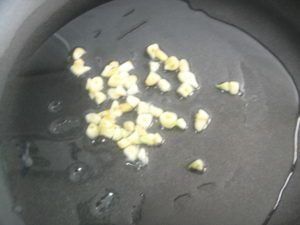 Add chopped garlic and stir fry till golden brown. 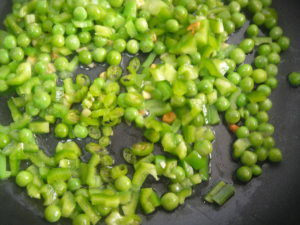 Add green peas and finely chopped capsicum, stir fry for 3-4 mins. 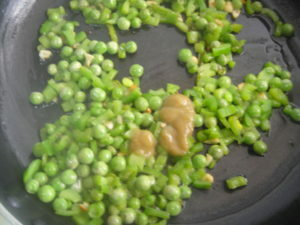 Now, add green chilli sauce and salt, mix well. Next add rice and mix well, in the rice veggies mix add white vinegar. Lastly add chopped coriander stir fry for 1-2 mins. Very easy and tasty recipe. Thanks for sharing. 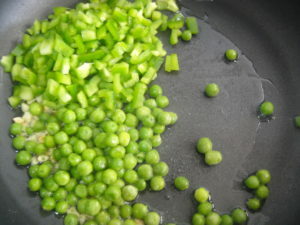 I have lot of peas will surely try this one ?? Do share your feedback Sonali ! This is such a simple recipe and I am sure it will be tasty too! So simple and easy. I made it for lunch today and the only addition I did was spring onions. Loved it Alisha! Wow ! I am so happy that you tried it. Thank you for feedback. 🙂 I will also add spring onion next time.